by Nick Kotecki, photo by Lisa Marie Knapp Nathan Moomaw has his hands in the dirt. He runs the show every Sunday at the Riverwest Gardeners Market. He keeps the grounds clean. He coordinates the vendors. He assists customers. He makes sure everyone’s happy, fills the five-gallon jug of ice cold drinking water. He sets up tents and tears them down at the end of the day. “Do you want help taking down the tents?” Lisa Knapp, his co-organizer, asked. Now, Nathan might be a little tall, he might be a little dark from being in the sun all day, and yeah, sure, he might be a fairly handsome dude, but Nathan wasn’t showing off his tough guy bravado one bit, he was just being practical: setting up and tearing down is part of his day job. “I take down five tents by myself every time I work,” he explained. In addition to running the neighborhood gardener’s market, every week he also travels to several others throughout southeast Wisconsin. He works for the Mukwonago-based Simon’s Gardens, holding down their stand, selling their fresh produce and vegetables, setting up and tearing down the display booths. That’s now. Before Nathan came to Milwaukee he was in Portland, Oregon. He grew up there. After high school he moved. He went south, did a brief stint in San Francisco studying film, and then went back up the West Coast to Seattle, where he got a degree in audio production. After graduating he decided to make the move to the Midwest. His first stop was Chicago. He left Seattle with friends of his to put their degrees to use and work on their dreams. In Chicago, they would build their own business and recording studio. Things ended up different than Nathan had planned. “I basically had a mobile recording studio in my car,” he said, laughing. Throughout his six years in the recording industry, most of his gigs were with Roosevelt University’s Chicago College of the Performing Arts. “I recorded whole orchestras playing, with over 200 people,” he said. The experience was one of those once-in-a-lifetime deals. He was able to record in the Auditorium Theatre, renowned for its unique acoustics. It was built in 1889 by the highly acclaimed architectural team of Louis Sullivan and Dankmar Adler and was a world class performance venue for its time. The Auditorium Theatre is also a National Historic Landmark. There are times when an itch must be scratched, when cups must be filled. Things change. Lives change. There are chances which beg to be taken, desires to be put out of arm’s reach and in hand’s grasp. One such time came to Nathan. This is when he left Chicago and his recording business, when he moved to Beloit, Wisconsin to work on a farm. This is when Nathan fell in love. “I love growing things and love helping growers. I love fostering community,” Nathan said. Soon after his tenure as a farmhand in Beloit, the opportunity to move came again, this time to Milwaukee. His wife (sorry ladies, this man is taken) had just landed a position at the Milwaukee Art Museum as the Assistant Director of Visitor Experience. “We had three weeks’ notice,” Nathan said. They packed their bags and began the nerve-wracking search of finding a place to call home in an unfamiliar city. They settled on a house across the street from La Escuela Fratney, the bilingual feeder school of the Lincoln Center of the Arts, and have been living there ever since. That was two years ago. Now, Nathan is here in Riverwest, working in sunny Garden Park every Sunday doing what he does best: helping local farmers make local connections, giving back to the community. Nathan gives an example of his work: “One of the bakers here, Erma, she bought rhubarb from the Chang family and used it to make rhubarb pies for the market. The next week, the Changs were buying her pie, eating their own rhubarb. That’s the lowest carbon footprint there is.” The Chang family has been regulars at the Gardeners Market since long before Nathan moved to the Midwest, eleven years to be exact. Erma’s bakery, on the other hand, is new on the Gardeners Market scene. Nathan stresses that the Gardeners Market is an important asset to Riverwest. He’s quick to point out that many of the growers here rent the fields they work in and do not have the manpower or machinery to produce in bulk. “It’s sustainable,” he said. “It’s free for the community.” Local growers are able to have face-to-face contact with their customers and ask them questions about the food they buy – a rarity in this age of large scale, mass agriculture. Many of the products here are cultivated by hand, including the Chang’s produce line and the plants of nine-year Gardeners Market veteran, Jan Posik. He can’t do everything by himself though. Even with co-organizer, Lisa Knapp, there is still work to be done in Nathan’s eyes. He doesn’t seek to expand the market so much as tighten up what he sees as loose ends. He would like to have biographies of the vendors on the website (riverwestmarket.com) and see more prepared food, dairy, meats, and orchard fruits like cherries and apples available for sale. He wants the Gardeners Market to evolve into more of a “Gardeners Picnic.” How is this work going to get done? “We need more volunteers,” he said. So what does Nathan like to do outside of the Gardeners Market? “I don’t even know anymore,” he said, laughing. “I don’t have time for hobbies. My hobbies turn into my work.” Although he’s only been here two years, he’s left a sizable (non-carbon) footprint on the neighborhood. He’s been on the Board of Directors of the Riverwest Neighborhood Association, helped create a community garden in Harambee with Off the Grid, a non-profit organization, and regularly throws his hat in the ring to help out at neighborhood events. At the Riverwest Follies this year, he put his recording skills to use, mixing the various soundtracks each performer used for their sets. He also built and designed the Riverwest Gardeners Market website which launched this year. 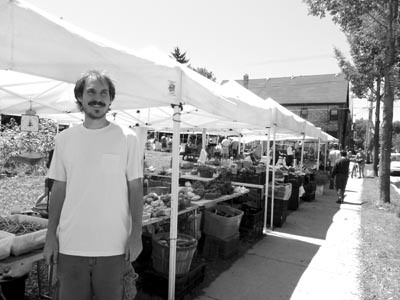 Find Nathan Moomaw at the Riverwest Gardeners Market on Sunday afternoons. Join the picnic. Grab yourself a bouquet of fresh cut flowers for your lover or friend, maybe a bundle or two of garden vegetables to make that fine meal you’ve been craving. Come on over, catch a seat at a picnic table, and bask in the cool shade of the umbrella that Nathan raised for you.